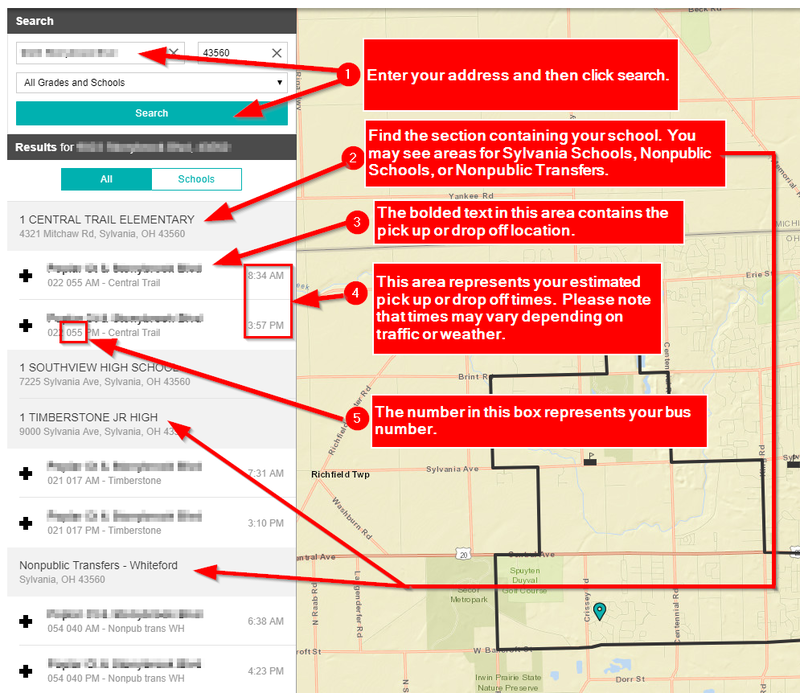 Starting with the 2018-2019 school year, you will be able to find your bus number and pick up times by using the interactive map below. Start by entering your address. Please note, busing information is subject to change as we approach the 2018-2019 school year. Please be sure to check back for updated busing information 24 hours prior to your first day of school. When entering your street address, you may need to enter street abbreviations such as 'Rd', "Ln', 'Ct', etc. If you are unable to find your address, try entering it without the zip code. There are some areas where the lines between zip codes cannot be distinguished. After searching, the assigned Elementary, Junior High, or High School will appear on the left-hand side. Assigned pick up/drop off locations, bus numbers and times will be listed in the results. Please note, that times listed below can fluctuate due to traffic or weather. If you wish to overlay the district boundaries, you can use the tool/setting icon ( ) displayed in upper-right of the map. You can also use the +/- icons in the lower-right corner of the map to zoom in/out. Please note, in order to make routes more effecient and consistent, the Sylvania School Board has adopted neighborhood stops throughout our district. Please check your pick up/drop off location, as it may have changed. Helpful information for finding your route.